I work with people who are out to fatten me up on a daily basis. I’m convinced this is a fact. Donuts, muffins, cakes, and cookies are forever circulating our office. It is a pereptual battle of resistance and self-discipline. I am a sucker for sweets. To make matters even worse, the cabinet that poses as our buffet table sits literally right outside my office. Every time someone walks by and grabs a tasty treat, I am reminded that they are there. Then, I immediately have to tie myself to my chair to resist the urge to run out and scarf down 5 of whatever is out there. On especially bad days, I can smell the desserts too. 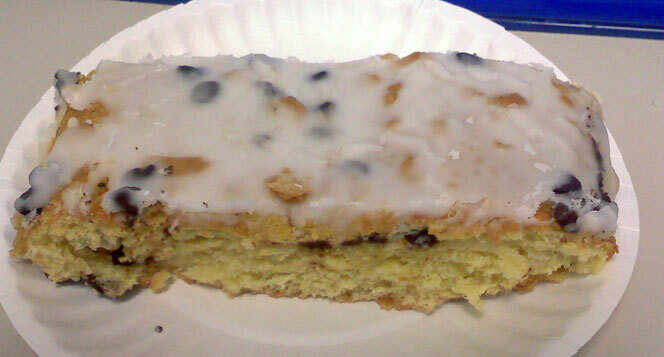 And, telling myself that I am going to have just one small piece is impossible. If I left myself have one, one turns into two, two turns into three, three turns in to twenty. In fact, I'm pretty sure my lovely coworkers lace all their baked goods with crack. Today, right outside my office, sits chocolate chip coffee cake: light, fluffy, smothered in glaze, and topped with chocolate. Be right back, have to clean the drool off my keyboard. Today I shall not fall victim! Today I have a secret weapon! My poor dog has doggie pink eye. Calling it doggie pink eye makes it sound cute and cuddly, but it is actually really gross. It has taken over his eyes. They are goopy and crusty and red and puffy and swollen. I mean, they are really flippin’ gross. But, that my friends, is what I think of every time the idea of coffee cake crosses my mind. I think of crusty, goopy eyes. And, in a matter of seconds ladies and gentleman, my appetite has disappeared. As far as my dog’s health is concerned, he’s off to the vet today. By Monday, I’ll need a new trick to get the dancing desserts out of my head.